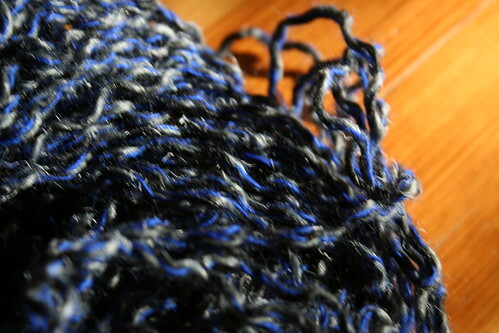 How do you tame stubbornly curly yarn? Almost exactly three years ago, I made Jason a hat. In a frenzy of cleaning and organizing a few weeks back, I came across the hat and asked him why I so seldom saw it on his cabeza. His answer: The hat had been a tiny bit loose when I made it, remember? Not a problem at first, he told me, but with each successive wearing it grew. It got bigger and bigger until it was really too big -- not to mention ineffective for keeping his noggin warm. In a world of intractable problems, I told him, this was one I could actually solve. I ripped the hat, gave the yarn -- a wool/acrylic blend, by the way -- a good washing, and hung it up to dry. I did some math and got the needles ready for a re-knit. But wait! The next morning the yarn was dry but still really curly. Huh? I repeated the bath (in warmer water this time, trying to relax the fibers a bit) and this time when I hung it to dry I hung a heavy hanger on the bottom of it to try to coax it straight. Still no luck. 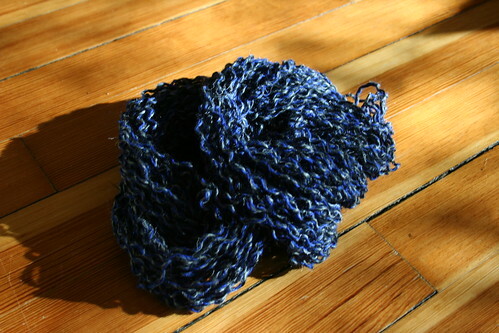 My experience has been that knitting with curly yarn makes for uneven, bumpy knitting. What else can I do to straighten this out? Can I apply more tension while the yarn is drying, or will I damage it? Is there such a thing as "straight enough" for knitting? Hm. I would have said to hang something on it while it dried, but you already tried that. I'd probably try it with more weight. I usually wind it around my elbow, wet it down and hang it from a doorknob or something. At the bottom of the yarn loop (I seriously don't know how else to describe this but am heartened by the fact that you probably know what I'm talking about), I carefully balance some sort of canned goods on it's side. (Knob at top, can at bottom.) I then wait until my husband asks me when I might deign to take the yarn off the doors and kitchen cabinets. By then, it's usually straight! Try wetting it and drying it with weight. Be sure to wet it for a really long time (about an hour), and then hang it with enough weight so that it looks totally straight while it is hanging. Don't take the weight off until it is totally dry (1-2 days).